WHAT ARE THE DATACARD CR805 ID CARD PRINTER�S KEY SPECIFICATIONS? 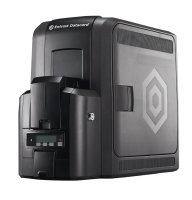 The Datacard CR805 ID card printer offers great value to organizations looking into printing high-quality ID cards reliably and affordably. Datacard CR805 Retransfer ID Card Printers fulfill enterprise needs to issue high-resolution and secure badges in a cost-effective way in high volumes. They offer increased capacity and the best print quality. Optional encoding capabilities: magnetic stripe, smart cards. Optional single or dual-sided lamination. Single-sided retransfer pigment ink printing (pigment ink provides longer-lasting images, photo-quality imagery, stunning resolution, and extreme precision�and has natural resistance to UV fading and the effects of plasticizers). Print speed: 100 single-sided full color cards per hour (CMYKP); 66 double-sided full color CPH. 600 dpi (23 dots/mm) continuous tone. True Color (ICC) printing; Vivid printer colors with higher saturation and contrast. Prints any design on demand without pre-printed card stock. Accepted Card Types: PVC to PVC composite, PC, or PET. Output Hopper Card Capacity: Up to 25 cards (optional 125-card hopper). Interface: USB 2.0 and Ethernet. Warranty: 3-year on printer and lifetime on printhead. WHICH OPTIONAL FEATURES CAN I ADD TO MY DATACARD CR805 ID CARD PRINTER? Dual-sided retransfer printing module�add more information to your cards by turning your printer into a dual-sided system. Enhance durability and security by adding an inline lamination module and optional tactile impression module. Ability to apply two layers of retransfer film to enhance card durability. Optional locks to prevent unauthorized printer use. Magnetic-stripe encoding module�add data to magnetic stripe, proximity, or contactless cards, for access control or secure multi-feature badges. iCLASS SE� encoder enables printer to be compatible with the HID secure identity ecosystem. PC Prox � supports personalization of EMV level 1 compliant cards. WHAT TYPE OF CARDS CAN I PRINT WITH MY DATACARD CR805 ID CARD PRINTER? The Datacard CR805 ID card printer is a versatile solution that lets you personalize any badge type. ID cards: print high-quality ID cards for your employees, students or visitors and identify at a glance every person who belongs in your facility. Access-control badges: keep track of who enters and exits your premises with access control badges to secure your company, school or building. Time-and-attendance badges: track your employees, visitors or students with one photo ID badge.